I think it would be somewhat of an understatement to say I have fondness for books about food, travel and culture. So when Laura Kelley asked if I would like to see a copy of her new cookbook The Silk Road Gourmet – the first of a self-published three volume series exploring the cuisines of thirty countries along the ancient Silk Road – I couldn’t hit the reply button fast enough to say yes. Covering the cuisines of Georgia, Armenia, Azerbaijan, Iran, Afghanistan, Pakistan, Bangladesh, India and Sri Lanka, this volume so chock-full of fascinating stuff I don’t even know where to begin describing it. It definitely belongs on the shelves of anyone interested in the culture or history of food, has a taste for the exotic or loves the challenge of the unfamiliar. Covering both well-known and barely-known cuisines, Laura confidently walks us through a mosaic of countries, demystifying their ingredients and techniques and offering up a sampling of the flavors and traditions unique to each one. She also highlights their parallels, pointing out how the Silk Road acted as a conduit for flavors and preparations from the Black Sea to the Pacific. As for the recipes… let’s just say my to-make list has grown exponentially: eggplants stuffed with pomegranate, lamb and rhubarb stew, pork chops with sour cherry sauce, cinnamon potatoes with pine nuts, pastries filled with sweet and spicy squash, chicken with apricots in lemon-pepper sauce, shrimp and pineapple curry, spiced coconut cake… Overall the book is well-written, well-edited and easy to navigate, and though it may lack some of the bells and whistles of glossy mass-market cookbooks, that’s just less to distract you as you make a beeline for the kitchen – which is the most important thing, right? And because I am so awed at the depth and breadth of this project, I asked Laura if she’d mind answering some questions about how the Silk Road Gourmet came to be. Tell me something about your background and how you came to travel to all these countries. Well let’s see . . . I grew up in an Italian-American household in the suburbs near NYC. Every Italian family is a food-family, so, to a large extent I grew up in the kitchen, helping my mom and older sister prepare meals, or just sitting there and talking or studying while my Mom cooked. I started cooking by myself as a creative outlet when I was about 13 years old, and dove head first into Indian food. When I was 16, I was an American Field Service student in Thailand and lived with a Thai family on the southern peninsula on a very rural farm (no running water, no electricity, and few modern conveniences). During that time I also traveled to Hong Kong, Singapore, Indonesia, Malaysia, and from stem to stern in Thailand. Accustomed to spending time in the kitchen at home, I watched a lot about what was happening in the kitchen and tried to get up in the morning to feed the monks who would come begging in the pre-dawn hours. I took notes about the foods I was eating and tried to figure out a lot of the ingredients myself. I would ask my “Thai mother” or AFS program staff what was being served and engage them in conversation about it. There was a long period of staying stateside while I was finishing my degrees. During that time, I continued to cook South Asian food and started to branch out into cooking Southeast Asian and East Asian foods as well. Cooking, at this point was still just a hobby and something I did to feed myself. I also sought out ethnic restaurants to try foods here. At this time cooking authentic Asian food in the US was difficult even living in and near major cities. I remember having to scour stores for galangal (a gingery sort of root). Today these things are a few clicks away on the internet. After I got married, I worked for years for a large, international public health project funded by USAID called the Child Health Research Project and traveled to the Indian subcontinent many times – also hitting Pakistan, Nepal, and Bangladesh. During this time, I paid a lot of attention to the food and started to write about where I ate and what was served as well as talk to the cooks at the guesthouses about ingredients for recipes etc. I also started to go to open markets and wander around with my driver or minder and ask him questions. As you can imagine, these notes have been invaluable in reconstructing recipes and menus for the Silk Road Gourmet. Why and how did you start collecting recipes on your travels? All the while I was traveling, I was collecting recipes. Most people were receptive to telling recipes. The only time I ever had anyone refuse was at a market – I guess they thought I might help a competitor get a leg up on their business. My travels started in 1980 and by the 1990s or so with all the cooking (and eating) of Asian foods I’ve done, I came to really know the taste of ingredients and would try to “reconstruct” the recipe of a dish as I was eating it – whether it be at a guest house or in a restaurant stateside. It’s still a parlor trick of mine. After this, I’d try to reconstruct it in the kitchen – the hardest ones had to be cooked 2 or 3 times until they sang. . .
Do you still travel frequently? I’ve been on another lull recently, working, raising kids, writing policy papers and books – but am itching to get on the road again. The farthest I’ve been for the last few years have been big trips to the American West with my hubby and kids on summer vacation. We are thinking about going to mainland China this summer – but not sure if we can make it. Turkey or Morocco may have to do. In 2006 I was in Southern Africa, and loved the “fusion” cuisine I found there (a combo of European, Indian and African flavors and ingredients). How did the idea to write a series of books take shape? The idea to write a cookbook started forming a few years ago in 2005 and 2006. Part of the idea for the book was fueled by comparing the recipes I’d collected and reconstructed with those available in lots of Asian cookbooks available here in the West. I felt there was a gap – Grand Canyon size – between the foods I was eating and cooking with the authentic recipes and lots of the recipes available in existing cookbooks. By and large flavors were toned way down in cookbooks when compared with their authentic cousins. I wanted to remedy this with my own book. Another idea that had been forming in my head for some time, was how similar dishes were between countries that were sometimes geographically separated by thousands of miles or major natural obstacles. I started to think of these similarities in a historical sense and kept on seeing how the Persian, Arab and Indian empires had influenced the food of the countries they ruled. During this time, I was also involved in a few projects examining the affects of globalization in the modern world for my day job – and that’s how the Silk Road concept came into view. The one book concept expanded into a three book concept and the project was born. I started working earnestly in 2006 on the project in my spare time (not working hours) and find myself here, now. Tell me about the process of researching, testing and writing these books. How long has the whole process taken? Volume 1 pretty much took two years from finger to keystroke to get a manuscript to the publisher. The research – as I’ve indicated in previous questions – has been over years and decades – but the actual writing and cooking and tasting and re-cooking has taken two years in my spare time, not as a day job. It all started at home – my husband is the Queen’s taster. I would cook dishes (sometimes 3 or 4 in smaller portions) for dinner and we would taste and talk. After I was happy with the recipes, I sent them out to family and friends who all cooked the recipes as well. I would often make revisions to the recipes if something wasn’t clear to a test-cook friend to improve it for The Silk Road Gourmet. Did you have to make any concessions in the recipes for the U.S. market? Certainly, no concessions were made for American or Western tastes. I went for the full flavor and by and large, the professional chefs and serious home cooks who have used the book have been happy with that. I’ve received a few incredulous comments from folks used to eating and cooking bland Europeanized versions of Asian food, but, hey – you can’t please everyone. Since one of the reasons I wrote the book was to get more authentic versions of the recipes out, I expected that some people would be displeased or challenged by the amount of flavor and the flavor combinations in the book. As to availability of ingredients, if I couldn’t get the ingredients or find a reasonably easy to find substitute, its not in the book. Sometimes, for instance, bottled sour cherries were used instead of fresh ones – which are hard to find – bit I could usually find everything either in a local store or online. I am a digital gal and do a lot of shopping over the internet. My site also has its own Amazon.com store that features lots of the spices and ingredients so people can use the portal right on my webpage to find things. One thing I did do, was make concessions for was the use of modern kitchen equipment, or methods of preparation. For example, instead of pounding ingredients for a sambal for 20 minutes, I used a food processor to get the grind going and then transferred to a mortar if larger pieces of ingredients needed to be included. Also forming ground meat kebabs on skewers is very difficult to do unless you have very hot skewers, cool to cold meat and a fair amount of experience. I gave cooks an alternative to prepare them as loaves or meatballs – which is culturally acceptable as well. We also don’t generally have have the type of ovens needed to cook samsas and bread – so I had to find alternatives to slapping the bread onto the inside of an incredibly hot oven. Can you give me a little sneak preview of the next two volumes? Happy to! Volume 2 which I hope will be out in mid 2010 covers the “fusion” cuisines of Central Asia, The Himalayas and the Indo Pacific. These are all cuisines that have unique fusions of western Asian and Eastern Asian food traditions and food cultures. I’m particularly excited about the Central Asia chapters – these were hard to research but now have some delicious, authentic food in them. Volume 3 covers Eastern Asia from Mongolia to the Philippines and I hope will be available in mid 2011. I’ve tried to fill it with recipes a bit off the beaten path from most eastern Asian books – like a delicious recipe for black (silkie) chicken from Northern China and a fish-flavored eggplant in clay pots from southern China. In both books, I’ve selected recipes that will follow through with some of the patterns and trends noted in the first volume. So there are recipes for kebabs, and stuffed peppers from Eastern Asia as well as dishes that show the Persian love of layering a far away as Kirghizstan or how the Kazakhs interpret an Indian Korma. And finally… if forced to pick a favorite from this book, which cuisine would you choose and why? That’s a really hard question to answer. . . In Volume 1, I’m thinking that Afghan food is probably my favorite (but sometimes I say Armenia or Azerbaijan). The reason for this is you can “taste the history” in Afghan food more than many other Asian cuisines. For centuries the Afghans have been “almost ruled” by a wide variety of peoples, from Persians, Alexander, Greeks, Buddhists, Arabs, Uzbeks, British, Russians, Afghans, (US) etc. and all of these influences can be felt in their culture and in their food. What you get on the Afghan table is a unique merger of Western Asian (still heavily influenced by European cuisine), the cuisines of the Levant states and the cuisines of the Southern Asia and the Indian Subcontinent. So, from the West we see familiar ingredients like fennel, bay leaf, mint and saffron. But these are often used in conjunction with ingredients from Southern and Eastern Asian like cardamom, ginger, and cinnamon rather than by themselves. I also love quinces and the Afghans use lots of them. . . Thanks for the fascinating interview, Laura! For heaps more interesting information on Laura, the book and the Silk Road cuisines, be sure to check out her website at www.silkroadgourmet.com. As soon as I received my copy of Laura’s book, I invited my in-laws over for a dinner featuring several of its recipes. 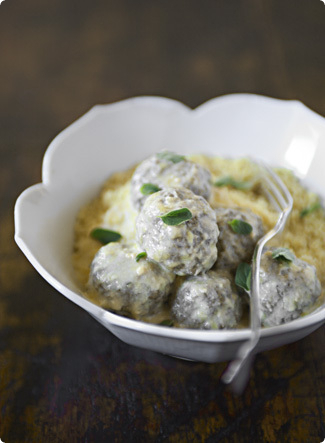 Everything was wonderful, but these subtly-spiced meatballs in a tangy lemon sauce were the hands-down winner. I shouldn’t have been surprised; in the book’s introduction Laura herself identifies them as a personal favorite. In a food processor, combine all the meatball ingredients except the meat and process until well blended. Add meat and blend again until well mixed. Refrigerate one hour. Shape into 2-inch (5cm) meatballs. Refrigerate another hour before cooking. In a large sauté pan bring the broth and water to a boil over medium-high heat. Melt butter in the broth. Add the meatballs and reduce the heat to medium-low. Cook, covered, until the meatballs are tender, about 30 minutes. Spoon broth over meatballs several times during cooking and turn meatballs over after about 15 minutes. Reduce the heat to low if necessary to keep them cooking only gently. I would make this…but have fishballs with coconut and cilantro and a bit more lemon juice and zest in the sauce! Hope you’re settling down…If you do plan on visiting the Netherlands…let me know! I bought Laura’s lovely book. It’s lovely, isn’t it? What a great interview! I follow Laura’s blog and it’s nice to get to know more about her. I’m still trying to figure out how I can get her books down here in NZ, but don’t worry, I’ll find a way! This book looks right up my street and I want to eat those meatballs right now! Thanks for introducing her/them! Thanks Melissa, that all sounds delightful. I’m gonna have to put the book on my Christmas wish-list now! They really are the best meatballs I’ve ever made. Tried them again in a tomato sauce and they went down very well with my two-year-old daughter – and that included the two dried chillies! great interview. must now go rush to get that lovely book. What a fabulous post.I loved every sentence. and I am going to visit the blog to read some more.Thank you so much for sharing. Prepared this for dinner tonight. Meatballs are nicely spicy, and the lemon sauce is not at all overpoweringly flavored of lemon. I will definitely have to keep an eye open for this cookbook; thanks for bringing it to our attention! I adore Afghani cuisine and also Armenian cuisine. I enjoyed reading the interview and will be more likely to buy the book after reading it; I don’t usually buy cookbooks when the authors go to the country and spend 3 weeks visiting and then produce a cookbook. I can see that this is not the case here and the author is keeping it authentic. I bought a book 25 years ago written by a French couple who travelled the silk road (Roland Michaud) and I had been fascinated with that area and the Tartars tribes since then. I wonder how much of it has changed. That looks like a great dish! Thanks for sharing it. I’ve never seen meatballs like those.